We are redoing the living/sitting room – long (and forthcoming) story, but we added built-ins, which had Consequences for where the existing furniture lives out its days. We had a fabuloso desk in one corner that also served as an end table. The changed layout meant we needed to move the desk out of the corner and replace it with a smaller end table. So hellooooooooooooo, Craigslist! 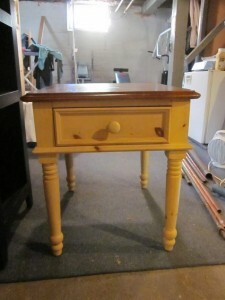 This little puppy isn’t really something I’d normally be drawn to, but (a) it’s an END TABLE, and (b) $20! And (c) I was totally going to spraypaint it. Between the woodwork and the piano and the cabinetry, there is a LOT of wood in that room, and we don’t need another end table’s worth. 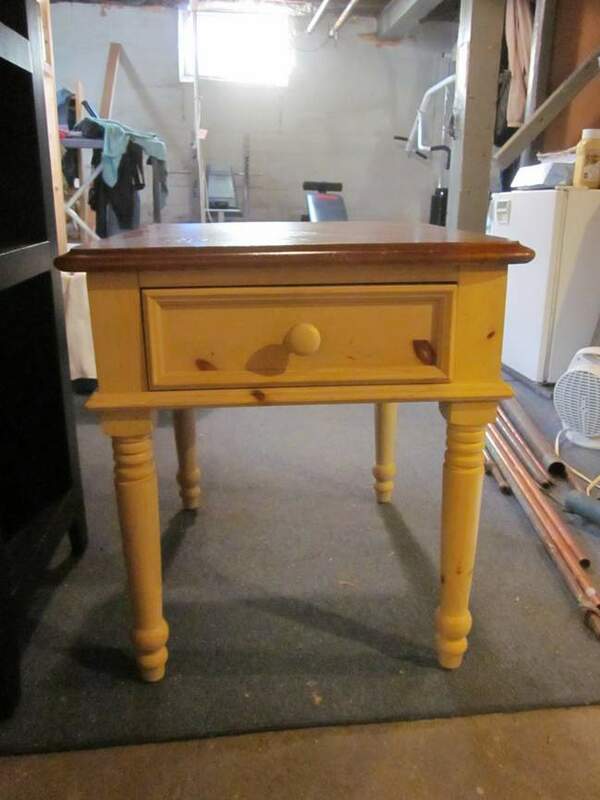 Picked it up, cleaned it up, fixed the drawer…aaaand spraypainted. NO PRIMING. NO SANDING. This end table and me, we’ve got iconoclastic verve. 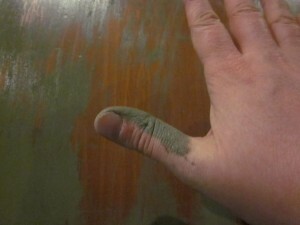 One can of Rustoleum “Oregano” (gray-green) later, and it was wholly presentable for our purposes. And then…and then…I decided to wax the top. TO PROTECT IT! The Internet said I could! AND? Uncle Fred gave us his “pure beeswax polish” some time ago. What could be better?? Uncle Fred! Gurning champion you might have been, but labeling compliance guru you were not. There was Something in that “pure beeswax”—possibly something petroleum-based—that melted the paint. Mineral spirits helped melt the rest so I could start the heck over. Design karma? This entry was posted in D'oh!, Decor, Furniture and tagged gray-green spray paint, polyurethane on painted furniture, sage spray paint, shellacking painted furniture, spray painted end table, spray polyurethane on painted furniture, spraypainting furniture, waxing painted furniture. Bookmark the permalink.